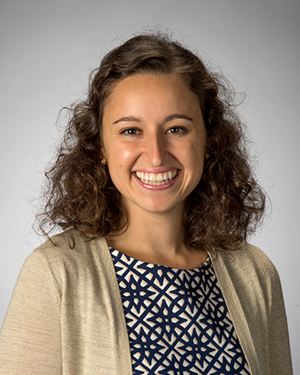 Emily Mediate, a 2015 University of Notre Dame graduate, has been selected to the American Rhodes Scholar Class of 2016. A native of Colorado Springs, Colorado, Mediate was one of 32 Rhodes Scholars selected from a pool of 869 candidates who had been endorsed by their colleges and universities. She is Notre Dame’s 17th Rhodes Scholar, and will commence her studies at Oxford University in October 2016. At Notre Dame, Mediate was a Dean’s Fellow in the College of Arts and Letters and a Kellogg Institute International Scholar. She graduated with degrees in Africana studies and pre-health studies, and a minor in international development studies. Passionate about global health issues, particularly in the sub-Saharan region of Africa, Mediate is currently a Kellogg Institute postgraduate International Development Fellow with the Association of Volunteers in International Service (AVSI) in Kampala, Uganda, where she is evaluating a USAID-funded program that aims to improve the well-being of children in HIV-affected families. “We are tremendously proud of Emily Mediate for this well-deserved honor,” said Rev. John I. Jenkins, C.S.C., Notre Dame’s president. Throughout her Notre Dame career, Mediate used her quantitative and qualitative skills to conduct global AIDS relief research culminating in a senior thesis that presented three ways in which international HIV/AIDS funding has constrained local efforts, summarizing research she completed in Uganda, Sweden and the Netherlands. She also conducted research on non-governmental organizations in Uganda, interned in a clinic there and assessed Ugandan health care facilities. As a Kellogg International Scholar, she assisted sociology assistant professor Terry McDonnell with research on HIV/AIDS prevention campaigns for three years. She was also a research assistant to chemistry associate professor Marya Lieberman on the Paper Analytic Device (PAD) project and a research assistant to sociology professor Christian Smith on the Science of Generosity project. In the fall of 2013, she studied in London where she interned with Save the Children UK. At Notre Dame, she also volunteered with Imani Unidad, an AIDS ministry group in South Bend, and co-directed the Dean’s Fellows in the College of Arts and Letters. Along with multiple other grants and awards that she earned during her collegiate career, Mediate was chosen as a Public Service Scholar by the B.A. Rudolph Foundation, an honor that supported her State Department internship in the summer of 2015, and received a Scholarship for Service from the Margaret M. Beeler Memorial Foundation. Mediate plans to pursue a master’s in evidence-based social intervention and policy evaluation (EBSIPE) at Oxford. She advanced through a rigorous multistep selection process for Rhodes Scholarship applicants. This year, approximately 2,000 students sought their institution’s endorsement; 869 were endorsed by 316 colleges and universities. Committees in each of 16 U.S. districts then invite the strongest applicants to appear before them for interview. Applicants are chosen on the basis of the criteria set down in the will of Cecil Rhodes. Rhodes Scholarships have been awarded annually since 1902 and provide all expenses for two or three years of study at the University of Oxford in England, and may allow funding in some instances for four years. Mediate worked closely through the application process with Notre Dame’s Center for Undergraduate Scholarly Engagement, which assists students and alumni with fellowships applications. Individuals interested in applying for the Rhodes and other awards are encouraged to visit cuse.nd.edu. Nicole Sganga, a member of the Notre Dame Class of 2015, and Kelly McGee, a current Notre Dame senior, were also finalists for a Rhodes Scholarship this year. To learn more about Mediate, visit www.nd.edu/features/emily-mediate. Originally published by Sue Lister at news.nd.edu on November 22, 2015.